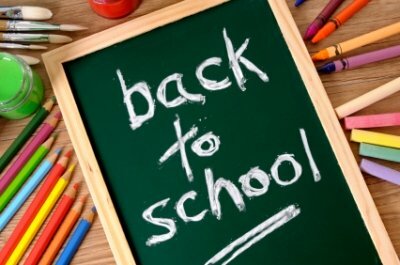 Welcome to my Back To School powerpoint page that focuses on presentations to use for the beginning of the school year. 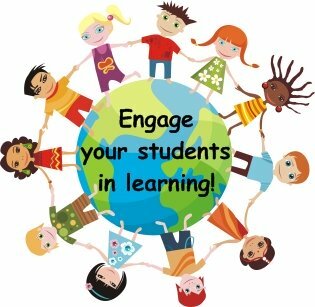 I have designed my powerpoint presentations to be engaging to your students. 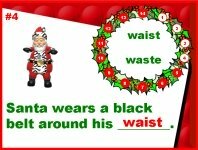 The powerpoint lessons on this page are designed with bright school backgrounds and animations. 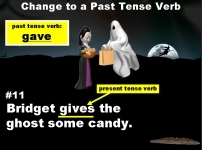 I use funny and attention grabbing animations when I am designing my Back to School powerpoints lessons. I also use colorful school background templates for the powerpoint presentations that I prepare. My Back To School powerpoint lesson plans have been designed using two fonts: Arial Black and Comic Sans. I chose these fonts because they are the most widely found on most computers, and they will not change the style and format when viewed on different computers. 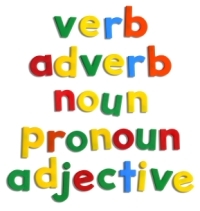 Many students find traditional grammar and math exercises boring and dull. I encourage you to use these Back to School powerpoint lesson plans to bring life to these typically boring lessons. Click on the Add to Cart button above to purchase this powerpoint presentation. 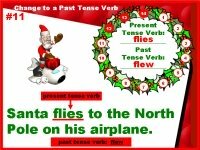 You will be emailed a download link for this teaching resource so you can download and use it today! 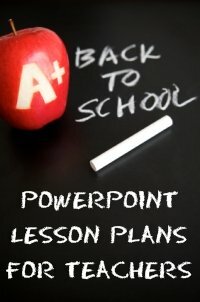 These Back To School powerpoint lesson plans contain 37 slides and are designed to be used for the first day of school. you will need to personalize and adapt to meet your own needs. 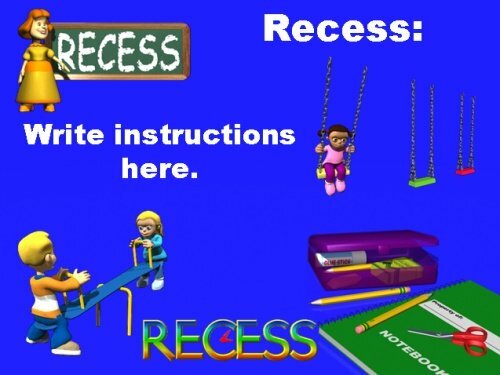 add additional slides to these Back to School powerpoint lesson plans. The first set of slides reviews classroom rules. I have used the general rules for my classroom, but you can change the wording in any of these slides to meet your own criteria and expectations. Listen carefully to the teacher's directions and follow them. Respect and be kind to others (shown below). Raise your hand when you want to ask a question. Complete your class work quietly. Respect classroom materials and equipment. Keep your desk area clean and tidy. Homework should be complete, neat, and handed in on time. Below is an example of a classroom rules slide. The second set of slides reviews school subjects. I have tried to include all of the subjects that are in elementary school. or add new subjects if needed. 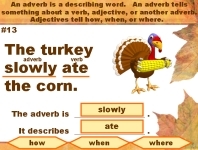 Below is an example of a school subjects slide. 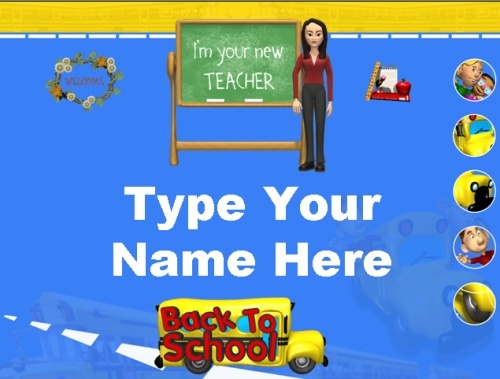 You will need to type in the teacher's name for each subject area. The third set of slides reviews general school procedures. I have used the general procedures that I cover with my students on the first day of school, but I left the instruction areas blank for you to type in the procedures that are specific for your school. Below is an example of a general procedures slide. The 37 slides in this lesson will help you to create an eye-catching and informative First Day of School presentation for your students. 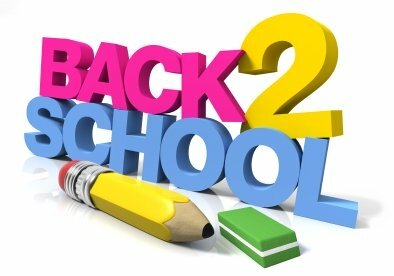 There are numerous animated graphics in these Back To School powerpoint lesson plans representing school themes and the different school subjects. Normally designing a presentation like this would take you many hours. should be able to adapt this lesson to meet your own needs in less than 30 minutes. 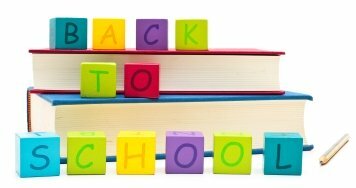 Click on the link below to download a free sample of these Back To School powerpoint lesson plans. 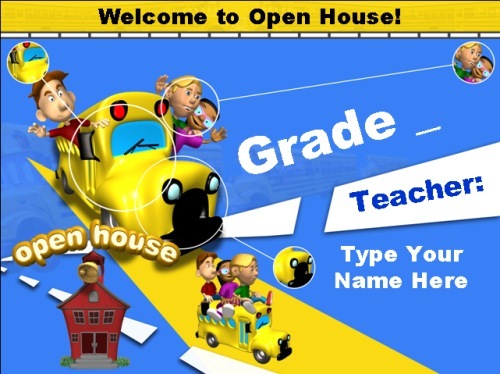 This Parent Open House powerpoint presentation contains 47 slides. Most teachers, even those with many years of experience, get a bit nervous about Open House and speaking in front of their students' parents. I hope that this set of Open House powerpoint lesson plans will help you feel confident and well prepared when you make your Open House presentation to parents this year at school. You can delete slides that do not pertain to your class or add additional slides. The first set of slides helps you to introduce yourself and there are two slides. The first slide (shown below) is for your name and the second slide (not shown) contains an area where you can type your teaching history, philosophy, or any topic that you wish to discuss. You could easily include a photograph of yourself on either of these slides. Below is an example of the teacher introduction slide. 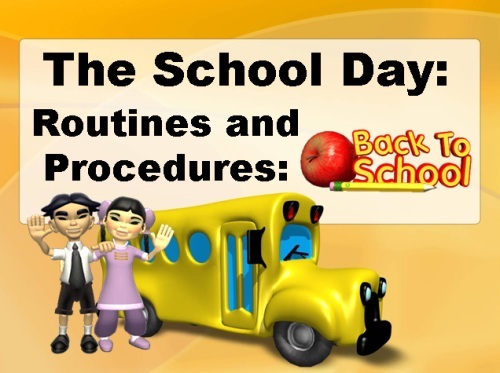 The second set of slides covers school day routines and procedures. I have used the general procedures that I cover with parents at my Open House, but I left the content areas blank for you to type in the procedures that are specific for you and your school. You can delete procedures that do not pertain to your school, or add new procedures if needed. of slides that reviews school day routines and procedures. The third set of slides reviews materials needed for class. 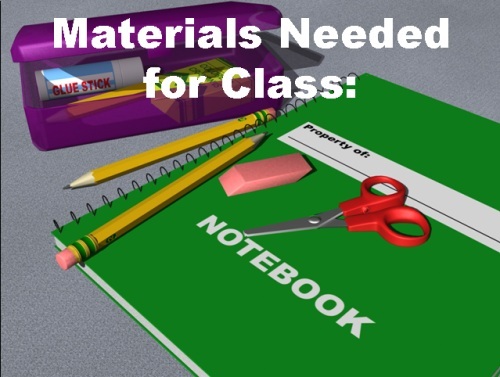 You can delete school supplies that you do not require your students to have, or add new school supplies if needed. set of slides that reviews materials needed for class. The fourth set of slides covers school teachers and subjects. 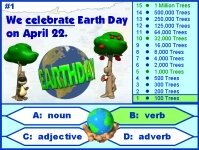 I have tried to include all of the subjects in elementary school that students have. You can delete subjects that do not pertain to your school, or add new subjects if needed. For this section, there are two sets of slides for each subject. 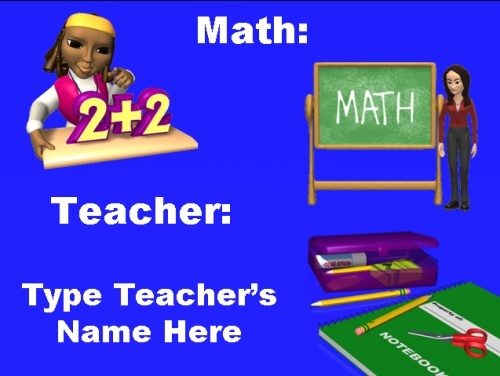 The first slide introduces the subject and the name of the teacher who teaches that subject (if it is someone other than you). 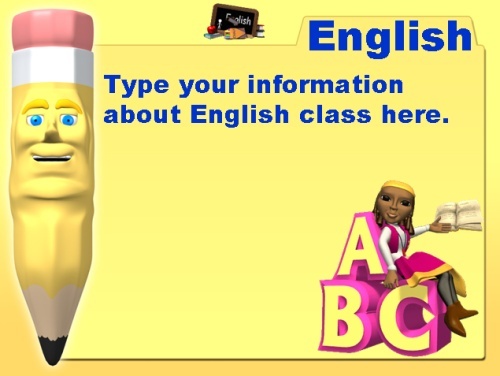 The second slide contains an area where you can type instructions and important information about that subject to share with parents. It would be easy to include photographs of teachers on either of these two slides. 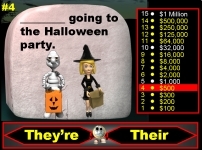 Below are examples of the two English slides. The fifth set of slides reviews homework. For this set of slides, there is a title slide and the 5 days of the week: Monday, Tuesday, Wednesday, Thursday, and Friday. I try to establish a weekly routine that my students and parents learn to expect and get use to. On certain days, my students may have English or Science homework, while on other days they may have Math or Social Studies homework. 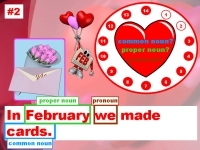 Of course, there are days when there are special homework assignments that do not fall into this general routine, but I try to follow a weekly homework routine whenever possible. If you assign homework in a different manner, you could chose to adapt these slides to your own teaching style, or delete them if you do not want to discuss this topic during Open House. Below is the Thursday slide for this set of homework slides. The sixth set of slides covers "How Parents Can Help." I have used the general topics that I cover with parents at my Open House, but I left the content areas blank for you to type in the information that you would like to discuss with your parents. You can delete slides that do not cover the topics that you wish to discuss, or add new topics if needed. set of slides that reviews How Parents Can Help. The 47 slides in this Open House presentation will help you create an eye-catching and informative parent presentation. 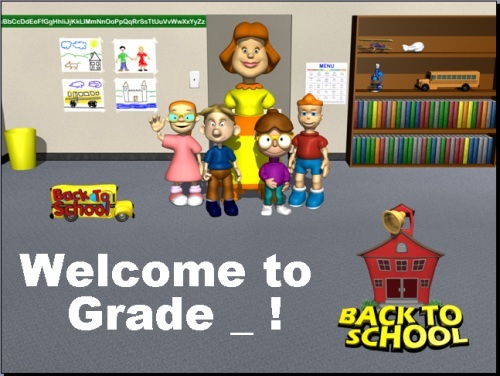 There are numerous animated graphics in these Back To School powerpoint lesson plans representing school themes and the different school subjects. should be able to adapt this lesson to meet your own needs in less than an hour. to feel prepared, confident, and less nervous as Open House night approaches. 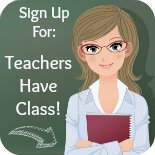 Click on the link below to download a free sample of these Parent Open House powerpoint lesson plans. wide variety of themes and holidays that occur throughout the school year. 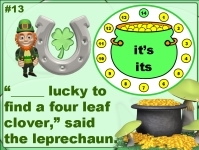 Thank you for visiting my Back To School Powerpoint Lesson Plans page.